Shoppers in Cardiff city centre have been left scratching their heads over this sign in St Mary's Street. 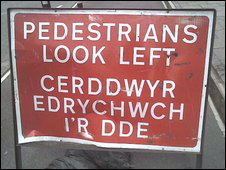 You see, the Welsh version translates back into English as 'pedestrians look right'. So, is it a mischievous plot to cull the English tourists? Or was the sign-maker an English speaker with a grudge? Either way (geddit?) it's an omen. Oh, OK. It's just a bad sign.